We sent out a Design Team Call and had a wonderful response! Thanks so much to everyone who participated! Please check out their blogs and join us in welcoming them to the team. Can’t wait to share their wonderful projects with you! Making Festive Gift Bags as a Thanks! Hi everyone, Steph Ackerman with Live Laugh Scrap here to show you how easy it is to create festive gift bags for family and friends this holiday season. 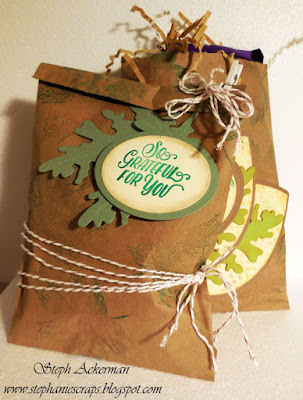 1.Stamp each bag randomly with a leaf stamp that has been inked with several colors of ink giving them a fall look. 2.Decorate one bag with large die cut leaves that have been tied together with Rose Gold Vintage Metallic Twine. 3.Adhere to the bag with a sentiment then add raffia and a treat inside. 4.Tie Rose Gold Vintage Metallic around the second bag. 5.Place a small gift or candy inside, fold down the top edge;and use a tiny clothes pin in the corner. 6. Tie additional twine to the corner and place die cut leaves and sentiment under the folded edge. These would make wonderful treat bags for the Thanksgiving table for family and friends. They’d also make a nice little treat for our teachers. She then added some spider web and die cut with Halloween motive, with a little bit of Orange Solid Divine Twine as an accent. In the end she added a few spiders and some black & orange mists! Boo! All Done and ready for those Trick-or Treater’s at the front door. Michelle P. is back today with a little Halloween treat that she made for one of her good friends. Halloween is her jam. She’s in to those little candy skulls, sugar skulls, whatever they are called. You know, those skulls that are all colorful and cute ….even though they are still a skull! She picked up some of her favorite chocolates, and some cute skull tin candies and packaged them up all funlike using pieces from our Whisker Graphics website like this super cool Divine Twine Twist in Halloween pattern. Bags are the best for wonky-shaped things. Don’t get me wrong, I love me some gift wrapping with boxes and paper too, but a bag will accommodate just about anything. These Horizontal Stripe Middy Bitty Bags in orange and black are naturally perfect for the occasion. I die cut a little banner piece, and the numbers 31 (for October 31st) in purple because sometime over the last 10 years Halloween colors went from black and orange to black and orange and purple and green, right? I used a Large Colored Tag in green and layered fun bits with it using dimensional adhesive. Dimensional adhesive is so great. Adding spaced layers while being your adhesive. And then I stacked my bags together, tied my twine around it, layered on my tag – and we are gift-ready! Kerry M. could not wait any longer. She and her kids just love October 31 and had to make something Halloween themed! Fill bags and bucket with candy, movie tickets or jewelry and enjoy! Find everything you need to make this project @ Whisker Graphics! Thank-you Bitty Bag with a Little Love! Noe I.G., one of our International Whisker Graphics Design Team members from Spain created this beautiful ‘Thank-you’ Bitty Bag with lots of gorgeous details! It´s Noe here sharing with you my first post as DT Member of Whiskers Graphics … I’m so happy for being part of This wonderful team! For my first post I made a Thankful packaging using “Middy Bitty Bags – Plain Brown 5×7´5” and “Solid Red Bamboo Twine”. Very easy to make… Cut with your Big Shot or similar machine your favourite pattern on adhesive vinyl and place in the center of your bag… Then, add some pretty ribbon, stamp your sentiment and finally, surrounds the bag with a piece of twine to finish decorating your packaging… Love Backer twine for finish my Projects!! Our Whisker Graphics Design Team project today is from Janae P.
Hi all, I just got my first String Creations Stitch blank by Plaid Crafts and was excited to use my Whisker Graphics Divine Twine on a project I’ve been wanting to put together. My first step was deciding which colors and how I wanted to design my United States. I love the red, white and blue patriotic colors and decided to go for a subtle mix of those colors with a little tan thrown in to accent the wood. I put my masking tape on for a clean edge and applied the paint. I was worried at first that it would clog the little holes, but found they stayed clear through all the coats. Once I was done with blue I let it dry, peeled off my masking tape and then applied another layer covering the blue side. I added my tan paints and let it dry, then removing the masking tape. I used the red twine to highlight my favorite places to travel and the white twine to highlight places I hope to go. I’m excited that every time I pass this piece in my house it will remind me of so many good memories and I’ll remember the future adventures I have to make. …then adhered a paper heart over it with a 3-D adhesives. I then tied a few strings in single knots and put them through the holes of my one-day vacations. I had a cute clipboard lying around that I though would be so fun to display it on, so I glued it down to some white cardstock and threw on some thickers saying “explore” with an extra little paper heart! I love how this piece turned out and am excited to add different colors of twine for different spots I want to highlight in the future. We’re looking for new Members for the Whisker Graphics Design Team! Design Team members put their creative talents to work once per month to showcase Whisker Graphics products. we’re on the hunt for our Fall / Winter 2016 Design Team now. Want to learn more? Email hello @ whiskergraphics.com for more information or to apply – just include a link to your blog so we can see your work. Thanks as always for your interest in Whisker Graphics, friends! Our Middy Bitty Bags in Red Chevron, Polka-Dot and Polka Dot on Natural Kraft are the perfect food-safe bags for your fresh fruit from that spring time garden! You are currently browsing the Design Team category at Whisker Graphics.